Ottawa is a green city, packed with parks and open spaces. As the capital of Canada, it sports numerous national attractions and top museums. Without question, a holiday in Ottawa is a busy whirl of sightseeing. The city also has a hectic events calendar, so it is wise to check what's on when planning to visit. Fun festivals take place throughout the year, from ice-carving in winter to exploring tulip gardens in the spring. 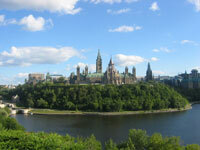 Everyone will enjoy a holiday in Ottawa, though the city is particularly well suited to more active vacationers. They'd enjoy cycling along the city's miles of trails, or ice-skating down the Rideau Canal in winter. 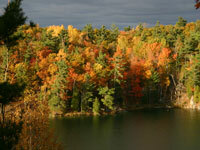 Extreme outdoor activities like bungee jumping and white-water rafting are also on offer just outside Ottawa. Top attractions include the National Gallery of Canada, and Parliament Hill, the seat of Canada's federal government and the site of frequent pomp and ceremony. Visitors should also stop at the Canadian War Museum, the UNESCO-listed Rideau Canal, and the ByWard Market, an historic farmers' market by day and popular entertainment venue by night. Visitors can tour the city on one of the open-topped tourist buses.